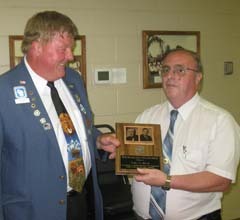 June 12, 2013 -- Gary Silah, a long time member and president of the club was awarded with an Birch-Sturm Fellowship by his fellow club members at the club's installation of officers dinner held at the Eden Lions Steak Fry in the Eden Community Center. Presenting the plaque is Fred Gebhart, Director of the Wisconsin Lions Foundation. 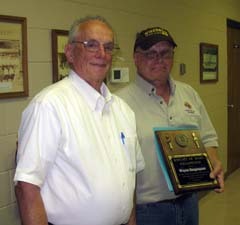 Lion Gary has served as president twice and numerous years as secretary for the club. He is also the cabinet-secretary, district convention co-chairman and diabetes chairman for the district. He can also be counted on to help out at all the fund raisers. Other FDL Evening Lions that are Birch-Sturm Fellows are Wayne Bargenquast, Bob Berryman, Charles Browning, Tom Clausen, Gary Colton and Mike Konen. June 12, 2013 -- Wayne Bargenquast received the prestigious Knight of Sight Fellowship at the Officer Induction Meeting. The fellowship was presented to Lion Wayne by the club for his support of the Eye Bank Transporter Team. Lions transport eyes and processed corneas for the Lions Eye Bank of Wisconsin. The Fond du Lac group relays tissue from Fond du Lac to Beaver Dam and delivers corneas to doctors in the Fox Valley and Two Rivers. Fond du Lac Evening Lions transport eyes at their own expense. The Knight of Sight is awarded by the Lions Eye Bank of Wisconsin Lions upon receipt of a $1,000 donation by the club or an individual to the Eye Bank. Other FDL Evening Lions that are Knight of Sight Fellows are Orv Doede (deceased), a past president of the Eye Bank, Frank Bartzen, Tom Clausen, Gary Colton and Erv Karls.